Audio Obscura, Greenlaw, Lavinia. Attended Wednesday, 5 October 2011 at Saint Pancras Station London. An obscure experience in a train station, indeed. 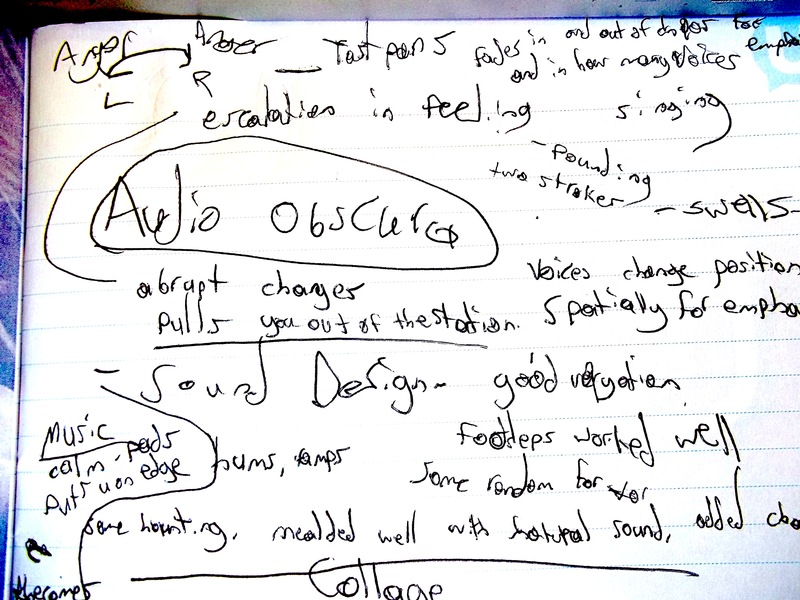 Audio Obscura was a mix of creative writing and sound. In one light it comes across as a collage of humanity and human emotion in different forms. There is a flow and build throughout. At the start the sounds mimic what might be going on around you in a train station. As we get further into the piece, musical elements appear and disappeared, tones swell and fade, the is on moment in which two dull thumps can be heard, some tones are ominous others are quite tranquil. Sometimes the job of the added sounds were to add chaos, sometimes to bring the listener into a very calm place. Sounds flowed well with the thoughts and voices. Looking specifically at the dialog we hear a mishmash of jokes, thoughts on losing loved ones, thoughtfulness on the obscure, gossip, random details, small talk, and all manner of other small moments in human language. I appreciated there were a variety of accents to help diversify. By the end we see that perhaps the main goal, consciously or subconsciously for humans is acceptance of ones self and love for all, at the same time realizing that many deny this of themselves. It was good to see Lavinia had into what people think and feel, that is hear and unheard on a daily basis. The sound accompanying did a superb job of bringing us into different moods as the subject matter changed.